Amazing what you uncover on Google Books. A review of Cassatt String Quartet, with guest cellist Christopher Finkel, premiering my String Quartet (1999) at June in Buffalo. “Christian B. Carey’s String Quartet (1999) is a rare effort to draw from jazz’s rhythmic style while applying an apparent serial language. The general depiction of jazz as a traditional palette (swinging, improvised-like solos) with tongue-in-cheek titles (‘Bebop a Lulu,’ ‘Elegaicism’ and ‘Lulu Redux’) makes for easily enjoyable music. Certainly the resultant serial sonorities have their own oddly saucy flavor, but all the more teeth for one’s wit.” – New Music Connoisseur, Volume 7, pp. 49. On this Sono Luminus CD, Terry Riley’s chamber works are superlatively performed by Del Sol String Quartet. Joined on the title piece by the composer’s son, guitarist Gyan Riley, the group navigates an array of rhythms, many of Spanish origin. Movement titles evoke the Basque region Vizcaino and the paintings of Goya. The final, eponymous, movement builds to an intense conclusion; Gyan Riley incorporates distortion and high volume, matching the whirling dance of the quartet in a rock-inflected finale. Stefano Scodanibbio, who died in 2012, was a friend to both Rileys. Diamond Fiddle Language (Wergo, 2005), his collaboration with Terry Riley, is a standout in both of their respective catalogues. After his passing, Gyan Riley presented a memorial concert of Scodanibio’s music at New York’s The Stone. He invited Del Sol to play the composer’s Mas Lugares ( su Madrigales di Monteverdi), a work they have since made their own. A five-movement homage to the early Baroque master, Scodanibbio takes his source material on all sorts of fascinating of twists and turns. A virtuoso bass-player himself, Scodanibbio wrote prolifically and eloquently for strings. Channeling and transforming early music was only one aspect of his work – he was well known for extended techniques and as a formidable improviser. This is reflected in Mas Lugares … : The piece isn’t a neoclassical take on its source material. Instead, it is a persuasive update with considerable refashioning. Originally premiered by Kronos Quartet, The Wheel and Mythic Birds Waltz is more of a minimalist affair than The Dark Queen Mantra. That said, few of Terry Riley’s pieces for quartet are unadulterated minimalism – apart from In C, his is a polyglot musical language. There are a considerable number of extended chords, folk-like melodies, and jazz-inflected wrinkles amid the repetitions. As such, the piece pairs well with the other two on the CD, and serves as a fitting closer. The Dark Queen Mantra is Sequenza 21’s Best Chamber Recording 2017. LA-based Populist Records has released another treasure trove of unusual ambience. 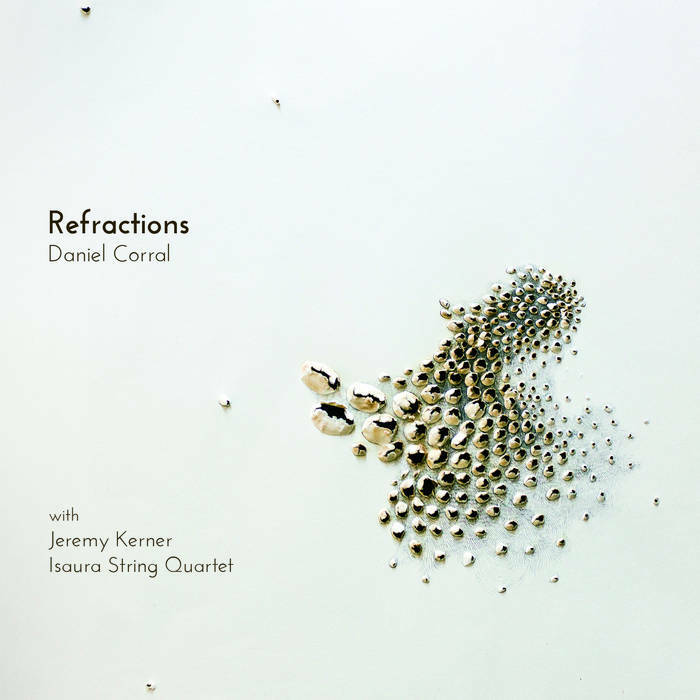 Daniel Corral’s Refractions, featuring the composer on music box laptop alongside electric guitarist Jeremy Kerner and the Isaura String Quartet, captures a compelling ambient composition. Delicate strains from guitar and strings are offset by bell-like interjections from Corral’s music box and swaths of sustained sounds from his laptop. The piece begins with all of these various textures and gradually is winnowed down to the music box, supplying minimal punctuations and offset repetitions in a slow ritardando until the piece’s delicate denouement and eventual close. Given the deliberate limitation of resources and lassitude of pacing, this slowly evolving piece of music is spellbinding in its execution. Rather than foregrounding the incremental shifts of material, the listener is encouraged to bask in a wash of sounds, varied and lovely timbres that are deployed with enough independence to seem to have minds of their own. On his latest CD for Yarlung, composer James Matheson presents strong essays in both the concerto and string quartet genres. His String Quartet, played in vibrant fashion by Color Field Quartet, is filled with overlapping scales and glissandos, post-minimal ostinatos, and impressionist harmonic colors. Thus, it presents as a postmodern response both to composers such as Ravel and Debussy and more recent figures such as John Adams and Aaron Jay Kernis. There is a similar variety of instrumental color in Matheson’s violin concerto. Its conductor, Esa-Pekka Salonen, is described in the liner notes as a great champion of the piece, helping to arrange for its recording (a live tape of the Chicago Symphony). The muscularly motoric violin part, played here by Baird Dodge, is formidable. The violin soloist is required to execute limpid runs clear up into the stratosphere of the instrument’s compass. In addition to its impressive solo part, the concerto’s orchestration has a cinematic sweep that is most engaging. The second movement, Chaconne, features a gradual build by the soloist, with the part starting down near rumbling cellos and basses and concluding within striking distance of high flutes (which seem to mimic gestures from movement one in slow motion). The concerto concludes with Dance, a moto perpetuo in which the violinist faces off with a boisterous orchestra (which ends on the supertonic!). The songs are idiomatically set, but I was left wishing for a less diffident performance than the one provided here. They were written for Kiera Duffy; perhaps we can hope that she gives them a hearing soon. Matheson’s musical language is appealing in its variety. He is also a creative orchestrator, parsing multiple threads of activity yet always providing music with a clear surface. At the Festival of Contemporary Music today, we also heard the premiere of Julian Anderson’s Second String Quartet. A fascinating piece filled with alternate tunings and myriad playing effects, it is one that I will be pondering for a long while. Here’s a video of a piece that I heard recently, Anderson’s Prayer for solo viola. It was played on a Locrian Chamber Players concert in New York.